The product you are viewing is the Waterproof 8 Zones Walk Through Metal Detector with Remote Control, which owns high precision 8 areas and more accurate detection. And the interfering signal of installation environment can be shown by the indicator light automatically. Beside it possesses the ability of intelligently automatic record the alarming times and number of people passed, which is really a function that is so helpful. But for this the strong omission proof and anti-interfering capacity has been achieve by applying the unique infrared setting. 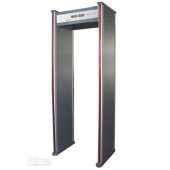 And since being equipped with the LED indicator lights as high as human body at the both sides of the gatepost the result will be clear at a glance. And though the gentle touch, you can operate it through the button easily. Apart from the above, it possesses cipher protection that can prevent parameters being maliciously changed by unauthorized people. Last but very important is that it is harmless to pacemaker, pregnant woman or magnetic storage media. 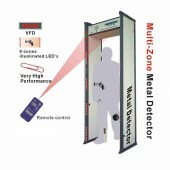 What an excellent Walk Through Metal Detector it is. Would you want buy one? Then just come here and add one to your chart, we promise to offer the high quality product at the best price. easy of placing my order.